Throughout the First World War, the band remained active, performing regular engagements as well as being involved with patriotic processions, recruit drives and farewelling the troops. In 1915, troops from the Dardenelles were welcomed at Central Station, with only two hours notice. Bandmaster W. G. Bentley left the band in 1917 and was replaced by Mr. Albert Arlom in 1918. Arlom remained Bandmaster for two years and resigned in 1920, being replaced by Mr. Fred Haines. A typical years work by the band during the 1920’s ranged from State and Police funerals to hospital concerts and fetes, Martin Place recitals, parades in the city and Showground, plus short country tours to towns such as Kempsey and Newcastle. Approximately fifty to sixty engagements a year, plus two rehearsals a week was the average amount of work. When not involved with the band, members were stationed throughout the various police districts of Sydney, performing routine police duties. Early in 1924, Bandmaster Fred Haines resigned, his place being temporarily filled by Mr. Arlom. On the 26th February, a meeting took place to elect the new Bandmaster. After three hours deliberation, Mr. H. Hawkins was selected from twenty-one applicants. On this same day, State Cabinet took three hours to decide the contract for the Sydney Harbour Bridge. On the 13th June, 1924, the band broadcast a programme from Farmers Studio, Sydney. This went throughout Australia and New Zealand and was the first broadcast by a military band in Australia. In 1926, Mr. Hawkins resigned and was replaced by Mr. Jack Crosby-Browne. During 1927, the band performed for the visit of the Duke and Duchess of York. A four-day trip to Canberra was also undertaken for a performance at the opening of Parliament House. In May 1928, a Mr. James Armour, cornettist, was appointed Special Constable to the band. Whilst ex-members had helped the band out from time to time, Mr. Armour is believed to be the first ‘Special’ in the band. By 1929, the second Special Constable, Angus Boras, was employed. He remained the only Special Constable in the Band, playing principal clarinet until the 1960’s. It appears that during the 1930’s, the Band, when attending engagements would march from the nearest Police Station to the performance venue, to attract a crowd. All engagements performed were either in relation to the Police Department or for charitable or National causes. With the exception of a few engagements, the Band did not receive payment, any money raised was donated to the function organisers. In 1936, the Band made the big move to convert from high-pitch instruments to low-pitch. This involved purchasing an entire set of military band instruments, forty-four in total, at the princely sum of Â£1288/12/11. The year 1938, proved to be a memorable year in the history of the Band. Performances were given at the Empire Games events as well as the many activities associated with the Sesquicentenary Celebrations throughout the year. It was whilst playing at one of these events, that the Band was involved in one of the City’s most tragic events. On February 13, the Band was performing on Sydney Harbour, on the Police Launch, “Cambrai” for the farewell of the visiting American Warship, the U.S.S. “Louisville”. 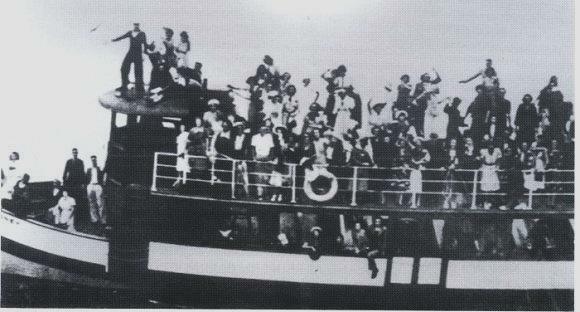 Hundreds of ferries and other craft were on the Harbour, including the month-old pleasure ferry, “Rodney”, crowded with 150 people, waving goodbye to American sailors. As the “Louisville” passed Bradleys Head, the “Rodney” went across the wake and, as it did, the passengers of the “Rodney” moved from one side to the other. Normally, this would not have been a problem, except that the majority of the “Rodney’s” passengers were on the top deck of the ferry. This sudden shift in weight, tilted the ferry dangerously to starboard. It poised for a few seconds, and as passengers fell, it overturned completely. The “Cambrai” was on the other side of the “Louisville” during the incident but was hailed by an officer of the “Louisville”, and arrived on the scene with the “Rodney”, keel up and passengers in the water. Eleven Bandsmen immediately dived in and rescued many stricken passengers, whilst others remained on board, resuscitating and calming survivors. In all, nineteen passengers drowned and it is thought that, without the work of the Police Bandsmen, the number would have been higher. Band members were later awarded a special certificate by the Royal life-saving Society for their part in the rescue. The “Rodney” moments before it capsized – Note that it already appears to have a list. The early years of World War Two were very busy, with the Band attending rallies, parades and recruit drives in addition to their usual activities. Up to double the number of engagements were performed, with the Band at one stage going twenty-one months without leave. Mr. Crosby-Browne was called up for military duties which led to his resignation from the Band. He was replaced in 1941 by Mr. O. Summertio.